Between translating School Rumble manga, watching a ton of anime and programming websites, I found some time to just chill out with Yotsuba&! the manga. Yotsuba&! 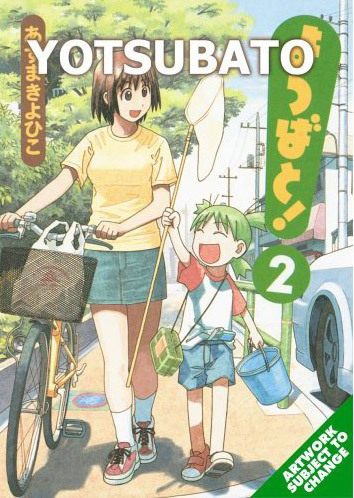 Volume 2 continues the adventures of the super naive green haired kid, Yotsuba. This volume of Yotsuba& is basically more of the same. There isn’t any kind of underlying plot or even a conflict. Yotsuba& is the perfect example of the slice of life genre. In this volume, she draws, goes swimming, buys cake, catches a frog, and does other simple stuff. The main reason any of this is interesting is that Yotsuba is incredibly amai (naive). It’s really cute just seeing her try to figure out obvious daily stuff. After talking about the whole demographic as genre thing previously, I realized that Yotsuba& is actually a seinen manga. This manga, however, doesn’t appeal to perverted salarymen like Strawberry Marshmallow, though. At least, I don’t think so… Rather, it appeals to the salaryman who yearns for simpler days. Yotsuba& is a natsukashii (nostalgia) manga. I’m surprised they haven’t had a Ramune chapter in the manga yet. Originally, I wanted to read this manga in Japanese since there seems to be very little dialogue. I was really surprised that there was no furigana for the kanji in the Japanese version. Now that I know it’s a seinen manga (for older men), it makes sense why there isn’t kanji. As in the previous volume of the manga, the art is great. In fact, I think it’s gotten better. There’s mostly cute kids, but the manga gets fanservice with a pool chapter! In this case, I think fanservice just refers to extra cuteness. Yotsuba is mainly just a good manga for chilling out to. The jokes are sorta one-dimensional (playing off of Yotsuba’s naivety), but they haven’t gotten old yet! I already have the 3rd volume of the manga on my shelf ready to be read. Hopefully ADV will release the 4th volume of Yotsuba&! eventually. Yay, Yotsuba ftw. For some reason, if an anime was made, I think it would be a brief OVA, but that could just be me. The more Yotsuba the better. She’s a pretty interesting character, too, as well as being hilarious, but I think I prefer the sisters, especially Asagi. She’s just wonderfully wicked. If you haven’t already seen it, the writer of Yotsuba& has a blog here: http://azumakiyohiko.com/. It’s in Japanese and there are many great pictures and drawings on the site. Yotsuba& is up to volume 5 in Japan, and it keeps getting better! That’s getting to be enough material for a whole series. Me too — Yotsuba ftw! I can’t see the manga going the anime route, unlike Azumanga Daioh, if only because… well, there’s ultimately not THAT much material to work with, outside of a short OVA as Hopeless suggests. It does, however, have longer stories than Azumanga Daioh, which would make episodes a lot easier to work with (instead of combining four slightly or non-related items, you have one chapter). It evokes the same sense of nostalgia that Strawberry Marshmallow does for me (even if Nobue is a yuri-lolicon), although it’s cuter and without the Miu-like figure that evokes hatred from the other characters. The closest they get is Asagi or maybe Ena’s friend, Miura. Even the adults tend towards childishness, which keeps the manga from getting too serious. But yes, her oddness IS cute, and that’s what makes the manga work. Definitely Yotsuba FTW. Incidentally, there was a picture of Yotsuba encountering one of the denizens of Animal Crossing some months back – gotta love it when the mangaka shares the same interests as their fanbase, yes? That’s not nostalgic for you? I thought yuri-lolicon is a time honored tradition of Summer everywhere? Don’t tell me it’s just my household? And Hung, you get those ADV bastards on skype next podcast and hardball them with where our 4th volume is. I need more Fuuka. The best thing to do is to sit back and hope another company decides to license it. Yup. Sinking all their money into a live-action NGE, which may very well fail, and dropping manga projects. Here’s hoping Del Rey or someone else is shopping, if it HAS been dropped. Although Neon Genesis Evangelion: Angelic Days was just released last month by ADV Manga and isn’t on the website either… perhaps it’s not dropped yet. Since when slice of life anime/manga has needed content? If they use all characters instead of just Yotsuba it will be easy to do at least 13 episodes. Reading this felt like Azumanga Daioh without less interesting parts, really funny and cute. I wish someone continue manga, Yotsuba&! deserves it. There might not be a Yotsubato! anime yet, but there is already an “image” album out, by the same people who did the Azumanga Daioh soundtrack. Coincidenty i just read this volume today. About Angelic Days, i think ADV manga only released it because it was an extra on the Evangelion box set. shirokiryuu: I just picked up Angelic Days Volume 2 at the bookstore today, so it’s STILL being published. If they had done it only because it was an extra on the box set, I suspect Vol 1 would’ve been the end of it. With luck, Yotsuba’s not been completely abandoned. Otherwise, we’ll have to wait for Del Rey to ride in for the rescue. Heck, they’re even doing Air Gear. > kanji in the Japanese version. How strange. We have the first five Japanese volumes — and they use furigana extensively. There is some occasional hand-written text — and if this consists of kanji, it gets no furigana. Curiously, Yotsuba’s utterances tend to use hiragana — where the remarks of other characters saying the same words are more likely to use kanji. BTW — what is your basis for assuming this is aimed at adult males — as opposed to a fairly wide general audience (both male and female). (Just wondering). 1. The ADV website hasn’t been updated since like 2002…. Holy McDonald Toys! I never noticed all my friends (which are all girls) say when the next one will come out. It so doesn’t appeal to pervy adults! My dad read it saying it’s right for my age and my friend’s too. My guess is that the author didn’t want for that to happen just thought “I’ll do a little kid’s comic ha ha ….it’ll be like so popular!” SEE I PROVED IT!!! Recently got vol. 6 (and only one more chapter to read). Lots of fun (as usual). Finally we get confirmation of Yotsuba’s age — she claims to be 6, but her father says that she is still only 5. She gets her first bicycle — and gets grounded for following Fuuka to school (and disappearing from home without any warning). A very family friendly series. This is the first and the best graphic novel I have ever read!!!!! ~:0)> I want to collect them ALL! Very good written information. It will be helpful to everyone who employess it, as well as yours truly :). Keep up the good work – looking forward to more posts. Very good written article. It will be supportive to anybody who utilizes it, including yours truly :). Keep doing what you are doing – looking forward to more posts.